The election of Donald Trump took Europe by surprise. What followed did not: Trump is surrounding himself with like-minded people, writes Juraj Mesik. Juraj Mesík is climate and energy advisor with Slovak Foreign Policy Association. A climate change denier will be heading the EPA, and the CEO of Exxon Mobil, Rex Tillerson, decorated with the “Order of Friendship” by Russian President Vladimir Putin, may end up as Secretary of State – to name just two highly relevant positions in the new US government. Facing the possibility of a Houston – Moscow – (Teheran?) axis, Europe´s leaders appear to be shocked and motionless. But is Europe truly powerless vis-à-vis an emerging anti-liberal and anti-climate alliance of Trump, Putin, and big oil? Is fossil fuel neo-feudalism the unavoidable future for the West? Will the hope of the Paris agreement be replaced by ever-growing CO2 emissions and accelerated climate change? Not necessarily. Europe has access to a number of tools to protect itself from the fall-out of emerging Trump – Putin alliance. One of them is ready to use. The name? Electric cars. The common denominator of climate change as well as Russian aggression – military or otherwise – is crude oil. Crude oil, providing humankind with one-third of primary energy, is also a key source of global CO2 emissions and, together with natural gas, is the source of over 60% of Kremlin´s budget. Three-quarters of Russia’s oil is being exported to the European Union, generating a huge trade imbalance between the EU and Russia. In principle, it is European consumption of Russian oil and gas that feeds the Kremlin´s military campaigns, aimed at freedom and the rule of law. It was European money that ended up financing the levelling of Aleppo, the occupation of Crimea, and the war against Ukraine. As around 70% of global oil is being used in transportation, the mass production of electric cars could dramatically decrease global consumption of oil. The question is how fast this change will happen. Electric cars are “in the drawers” of all major car producers: the challenge is not the technology. Electric cars are technically much simpler than cars with internal combustion engines – so much simpler, that electric cars could easily be cheaper to buy and much cheaper to run, than oil-dependent cars dominating our streets today. Forget the luxurious Tesla – electric cars do not need to be expensive. The main barrier for making them affordable for the middle class is the price. And the path to low prices is well known – they must be mass produced. There are one billion cars in the world today, feeding Exxon, Russia, ISIL and around 20 countries living off oil exports. In Europe alone, there are around 250 million motor vehicles, a large part of them over ten years old, and ready to be replaced. The market is huge. Those who will fill it with affordable low-cost electric cars will be winners on the global market. 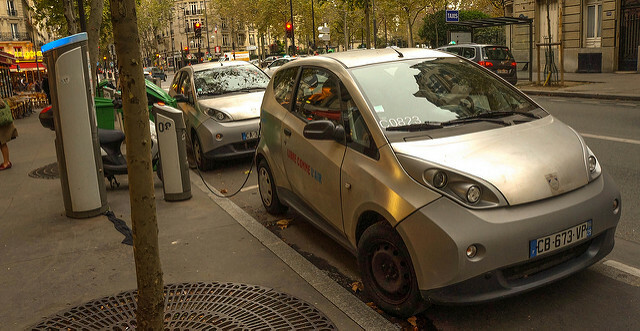 The EU has both strong reasons and powerful legal and financial tools to dramatically accelerate mass production of affordable e-cars in Europe. Brussels, Berlin, Paris, Rome and other capitals can use both carrots and sticks to doing so. The EU, for instance, spent billions of euros to build the Galileo, the European satellite navigation system recently put into operation. Only indifference can stop European institutions from creating a scheme to fast track and support conversion of European carmakers to mass producers of e-cars. The EU also has sticks to use. Making CO2 emission limits stricter is just one of them. The election of Donald Trump to the White House pushed the world and the EU into a crisis of predictability and a race against time. The European Union can choose to forget the Paris climate agreement and its founding ideal of peace. Or, alternatively, the EU can transform itself into an entity capable of acting quickly and decisively. As a response to the Trump-Moscow alliance, the EU must triple or quadruple its climate change efforts. It must stop financing Russian militarism at the same time. It is not an impossible task. Europe is not powerless. Massive production of disruptive e-car technology is the instrument, which is mature and ready. Europe needs to reinvigorate her dynamism, self-confidence, and hope. Europe needs her own, 21st-century version of Apollo program, the famous American response to Sputnik – only this time focused on our own planet, the Earth. And she needs to trigger it instantly. He’s an ‘advisor’ to whom ? the king of wishful thinking ?